Erin works in the mail order department of a music company. She was asked to fill the order on the right. Erin finds all of the material in stock, so she totals the order to prepare it for shipping. There is also a $4 shipping and handling charge for each order. Erin calculates $280 for the cost of the order. $280 is high for such a small order. SHe goes back to the original order to find her mistake. How did she end up with such a big number? There is a special order that must be followed when solving problems with more than one operation. Multiplication and division must be done before addition and subtraction. The order is called the order of operations. Erin should have multiplied before she added. So the total price is $82. When a problem has only addition and subtraction, work from left to right. Always multiply and divide from left to right before adding or subtracting. Step 1: Multiply and divide from left to right. Step 3: Add and subtract from left to right. Remember: Some calculators follow the order of operations. Some don't. We are going to continue our lesson on order of operations and you will be able to evaluate expressions using the correct order of operations. Find a numerical expression or equivalent for (an equation, formula, or function). The order established in which we solve an equation. Exponents are used as a short way to represent a number. 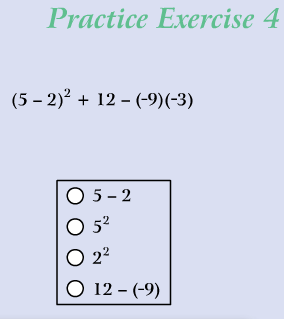 The exponent is the number of times the base is multiplied by itself. Some people think of negative as meaning "not." So if I say "I am not going to the store," that is sort of the negative version of "I am going to the store." So what do two "nots" mean? Consider this sentence: "You may tell me NOT to go to the store, but I'm NOT going to do what you say!" By negating your negation, I am insisting that I WILL go to the store. One way to think of numbers is in terms of money. Let's say you and I are playing poker. To make life convenient, we use chips instead of real money. A green chip is worth $5. A red chip means that you owe $5. So if you lose $5, you can represent that by giving up a green chip, or (if you're out) by picking up a red chip. Of course, you are always allowed to pick up a green chip and a red chip at the same time, because that doesn't change your total sum. (At the end, presumably, we'll cash in all our chips and see who gains or loses what money.) I hope you see the mathematical analogy I'm drawing here: A green chip represents +$5, and a red chip represents -$5. Make sense? If so, here comes multiplication in terms of chips. If you gain three green chips, what happens? Intuitively, you know that you gain $15. Mathematically, we take the +$5 that one chip is worth, and multiply it by +3, to indicate that you are gaining three chips. 3 x $5 = $15; positive times positive is positive. If you gain three red chips, what happens? If you think about it, I think you'll agree that you just lost $15. Mathematically, this looks the same as the previous example, except that the +$5 that represents a green chip, is replaced by -$5 to represent a red chip. 3 x -$5 = -$15; positive times negative is negative. Now, what if you lose three green chips? Once again, you have lost $15. We represent this "loss" mathematically by changing the 3 into a -3, so our equation is: -3 x $5 = -$15. Negative times positive is negative. And finally, what if you lose three red chips? Hooray! This is happy news, it means you have actually gained money. Mathematically, this is -3 (since you lost) times -$5 (since they were red chips). -3 x -$5 = +$15. Negative times negative is positive. What's happening on the left is that the numbers are going down by one. What's happening on the right is that the numbers are going down by 5. ...and so on. So this tells us that a negative times a positive is a negative. Now, let's do the same thing with the multiples of -5 instead of 5. Once again, a negative times a negative is a positive. Since the term on the left is negative (as we just proved! ), the term on the right must be positive. Today we are going to learn about the 'Order of Operations'. Numbers and operation signs are used to write expressions. You simplify an expression when you perform the operations. When there is more than one operation, you must follow the Order of Operations. First, multiply and divide from left to right. The value of 16 - 6 x 2 = 4. Would you come up with a different answer if you tried to solve the equation in a different order? What is the solution to this equation? When we followed a different order, we came up with a different answer. 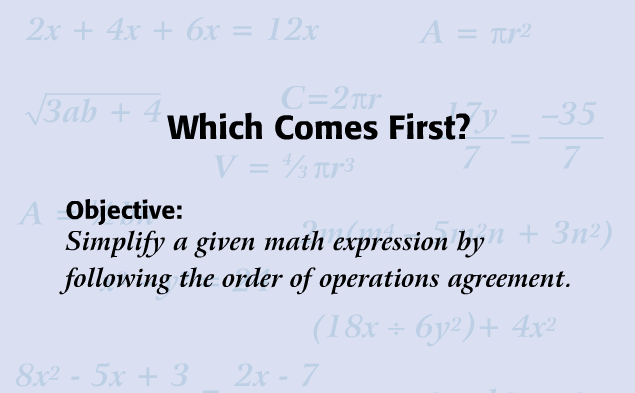 Therefore, it is important to follow the order of operations to find the correct solution. Rules that tell you which operations to do first. 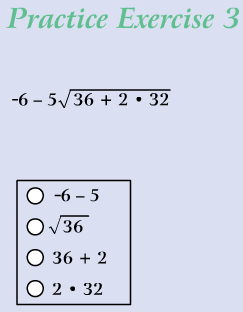 Parts of an expression that is separated by an addition (+) or subtraction (-) sign. Terms that have the same variables with the same exponents. A number that multiplies a variable. The grouping of more than two numbers that does not matter when you add or multiply. The product of any number and 0 is 0. A letter that represents a number. A constant is a number of variable that does not change. Replace a variable with a number or an expression. A statement that two expressions are equal. Adding 0 or multiplying by 1, does not change the number. The sum of a number and its opposite is 0. 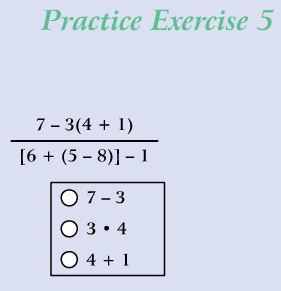 Multiply a sum or difference by a number by multiplying each term of the sum or difference by the number. Write the following equations on a piece of paper that you will turn in at the end of class. Take a moment to turn to your partner and explain how you solved question 16. Sometimes expressions contain parentheses. Be sure to do these operations inside the parentheses first. Do the subtraction in the parentheses first. Listen while a partner explains how to simplify the expression in number 13 above. Follow the steps as your partner explains. Compare your answers. Are they different? Why? A variable is a letter that stands for a number. Any letter can stand for any number. The letter t could be used to stand for a time like four hours. You can write expressions with variables, operations, and numbers. 1) What does 3y mean? 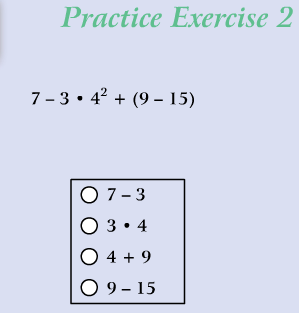 Write a variable expression using addition and multiplication. Have your partner solve it. Check their work.